A considerable part of the Soviet and Russian nuclear arsenal was comprised of long-range ballistic missiles deployed on submarines. Scale model of a Soviet submarine designed to carry ballistic missiles. 1955 Sept. 16: The R-11FM became the first Soviet missile launched from a submarine stationed on the surface. 1961 Oct. 19: The R-13 missile flew a test mission in preparation for the launch with the live nuclear warhead. 1968 February: The R-29D missile flies a test mission from a new navy test site in Severodvinsk. 1991 Aug. 6: K-407 Novomoskovsk became the world's only submarine launching 16 ballistic missiles (R-29RM Sineva) at an interval of several seconds and all of them hit their targets in Kamchatka successfully during the Begemot-2 operation. 1991 December: The R-21A/Zyb (SS-N-6) missile launched a 450-kilogram Sprint capsule designed to carry a 100-kilogram microgravity payload. 1992 Dec. 9: The R-21A/Zyb (SS-N-6) missile launched a 650-kilogram Efir capsule designed to carry up to 65-80-kilogram of payload for bio-medical research, known as Meduza (jellyfish) experiment. The flight and the retrieval of the capsule was successful, however, the payload failed to conduct the experiment. 1993 December: Re-flight of the Meduza experiment. 1995 June 7: R-29 RL/Volna (SS-N-18) missile launched an experimental reentry capsule with the microgravity experiment for the German space agency. 1996: K-407 Novomoskovsk and the K-447 submarines fired a batch of ballistic missiles. 1997 Nov. 19: The Bark missile failed and exploded during its third and last test flight. The program was discontinued after this attempt. 2001 Feb. 16, 13:28 Moscow Time (5:28 a.m. EST): An unidentified "sea-based" ballistic missile was launched during training exercise of the Russian Northern Fleet, the Ministry of Defense said. The launch apparently took place from the submarine in the Barents Sea and involved long-range ballistic missile. 2001 June 5, 15:32 Moscow Time (7:32 a.m. EDT): A submerged submarine launched a ballistic missile toward Kamchatka's Kura landing range during the exercise, Russian Ministry of Defense said. 2001 July 20, 4:31 Moscow Time (8:31 p.m. EDT, Thursday, July 19): The R-29RL (RSM-50) ballistic missile, also known as Volna launcher, carrying the solar-sailing spacecraft blasted off from the submerged Borisoglebsk nuclear sub stationed in the Barents Sea. After reaching an apogee of its ballistic trajectory at the altitude of about 400 kilometers, the experimental spacecraft was expected to deploy a pair of fan-like sections of the solar sail, which would be held in place by an inflatable frame. The spacecraft then expected to reenter dense atmosphere and land, using inflatable heat shield at the Kura impact range in the Kamchatka Peninsula. The elements of the sail would burn up on the reentry. However, due to software failure, the spacecraft did not separate from the third stage of the launch vehicle and burned up over the Kamchatka. 2001 Sept. 18: The long-range ballistic missile blasted off from the Podolsk submarine in the Sea of Okhotsk and successfully reached the target in the Barents Sea, navy announced. 2001 Oct. 18, 12:00 Moscow Time: Russia's Northern fleet conducted a training launch of the submarine-based ballistic missile from the nuclear-powered sub stationed in the White Sea. 2002 July 12: A Russian strategic submarine launched a ballistic missile carrying an inflatable reentry device designed to return cargo from orbit to Earth. The Volna rocket blasted off at 03:58 Moscow Time from the strategic nuclear submarine Ryazan stationed in the Barents Sea, a representative of the Russian Navy said. (The Volna is the "civilian designation" for the R-29RL submarine-based ballistic missile.) The launch targeted the Kura testing ground located on the Kamchatka Peninsula, however several days after the launch, the search team in the area was unable to locate the reentry device and its experimental payload, designated Demonstrator-2. The inflatable reentry technology, known as IRDT, was originally developed by the Khimki-based NPO Lavochkin design bureau for a Martian lander, within the Mars-96 project. Later the technology was adapted for use in low-Earth orbit and tested in three different configurations during two launches in 2000 and 2001. Only in one previous case, an experimental payload, called Demonstrator, was successfully returned to Earth. Attempts to return a solar-sailing spacecraft in 2001 failed. In 2000, a Fregat upper stage was believed to have successfully reentered the atmosphere using the IRDT, however, the search for the stage in the landing area yielded no results. 2002 Oct. 12: Russian armed forces had a busy weekend on Saturday, October 12, 2002, conducting the most extensive missile launching exercise in years. According to the Russian media, the nation's submarines stationed in the Sea of Okhotsk and the Barents Sea fired long-range missiles at the targets at Cape Kanin Nos in the Russia's northern regions and at Kamchatka Peninsula, respectively. On the same day, strategic bombers launched cruise missiles aimed at targets beyond the polar circle and the Volga River region. To complete the picture, the Topol ICBM flew a training mission from Plesetsk to Kamchatka Peninsula. 2004 Feb. 16: In the course of Security-2004 military exercise, in Severomorsk, President Putin boards the submarine TK-17 Arkhangelsk, which around 19:00 Moscow Time departs for the training area in the Barents Sea to monitor the launches of two R-29RM (Sineva) ballistic missiles from the submerged submarine K-407 Novomoskovsk (Delta IV by Western classification) scheduled for 10:15 and 10:22 Moscow Time next day. According to the Russian press, one missile was intended to fly toward the Kura impact site on the Kamchatka Peninsula, while another would become a target for the antimissile system onboard the cruiser Peter the Great, also stationed in the Barents Sea. A number of journalists were onboard the cruiser to witness the exercise. 2004 Feb. 17: Both attempts to launch R-29RM missiles from the K-407 apparently failed. Accounts of the events onboard the submarine varied wildly. An official statement from the Northern Fleet said that a satellite blocked signals for launches. However, Russian media reported that one missile either moved several centimeters in its silo, or was ejected from the submarine and then plunged to the bottom of the sea nearby. Search crews were reportedly attempting to locate the missile. To add to the confusion, admiral Vladimir Kuroyedov, the Commander-in-Chief of the Russian Navy, claimed that the submarine exercise envisioned a "virtual launch" only and no attempt of to actually fire the missile had ever been planned. He called reports about the failures a "gossip." Remembering awkward statements of the Russian navy in the days of the Kursk disaster in August 2000, few people in Russia believed such an explanation. From bits of information available at the time, it seemed that launches had been planned, but both missiles had never left their silos. While the independent Russian press scrambled to find out details of the events, the country's major TV channels, controlled by the government, "forgot" to mention the problems in the Barents Sea. By mid-March 2004, Russian media reported that a special commission investigating the mishaps during Security 2004 exercise, had concluded that the failure of the ADK-3M/Sluz automated launch system had caused aborts of missile firings on February 17. 2004 Feb. 18, 12:30 Moscow Time: The submarine Karelia (also Delta IV class ship) stationed in the Barents Sea fired a R-29RM (Sineva) ballistic missile toward the Kura impact range on the Kamchatka Peninsula. The missile lifted off successfully, however after 98 seconds in flight it deviated from the assigned trajectory and self-destructed, according to Igor Dygalo, chief of the Russian Navy's press center. 2004 March 18, 15:08 Moscow Time: A month and a day after high-profile failures of submarine-based missiles, Russia conducted another training launch from beneath the sea. On March 18, 2004, at 15:08 Moscow Time, the nuclear submarine K-407 Novomoskovsk, stationed in the Barents Sea, fired a R-29RM missile. The launch took place one month after a dual firing of such missiles from the same submarine was aborted due to technical problems. 2004 June 29: Russian Strategic Missile Forces, RVSN, test-fired an R-36M missile from the Baikonur Cosmodrome. The flight aimed to certify the service life of such systems for a 20-year period. In the meantime, the submarine Yekaterinburg (Dolphin Class, Project 667) from the Russian Northern Fleet launched a D-9RM ballistic missile from its underwater position in the Barents Sea. The missile's warhead successfully reached the Kura impact range on Kamchatka Peninsula. On the same day, a Tupolev-95MS strategic bomber conducted a training launch of a long-range cruise missile. After takeoff from its base in the town of Engels, Saratov Region, the aircraft covered around 3,000 kilometers before releasing the missile. The weapon reportedly hit its target on the island of Novaya Zemlya in the Arctic Ocean. 2004 Nov. 2: The submarine St. George based in the Sea of Okhotsk successful fired an unidentified ballistic missile toward the Chaise impact range at Cape Canine Los in Northern Russia, the Russian Navy said. In the meantime, the submarine Yekaterinburg (Dolphin Class, Project 667) from the Russian Northern Fleet launched a D-9RM ballistic missile from its underwater position in the Barents Sea. The missile's warhead successfully reached the Kura impact range on Kamchatka Peninsula. 2005 Sept. 28: According to the Kommersant newspaper, technical problems onboard the Borisoglebsk submarine scrubbed a training launch of the R-29RL (RSM-50) Volna missile, scheduled for 01:30 Moscow Time. It would be the first launch of this missile since its failure in June 2005 to deliver the Kosmos-1 solar-sailing spacecraft into orbit. Apparently, as early as September 26, 2005, the launch was delayed by at least 24 hours, and sometimes later, the decision was made to return the submarine to its base in Gadzhievo. According to Kommersant, problems with Solid Pressure Accumulator, PAD, which creates initial trust to push the rocket out of its silo and brings it to the altitude of around 20 meters above the surface of the water where main engine ignites, caused the cancellation of the launch. The launch finally took place on October 7, 2005 at 01:30 Moscow Time from the Barents Sea. The Volna rocket carrying the Demonstrator D-2R inflatable breaking device, NTU, flew what appeared to be a normal flight toward the Kura impact range in the Kamchatka Peninsula. However, initial efforts to locate the landing craft at the impact site were unsuccessful. The analysis of the telemetry from the launch showed that the inflatable device separated from the rocket and was spin-stabilized. Its navigation, video-monitoring and autonomous radio-telemetry systems were activated. The telemetry transmission from the spacecraft was received at the Kura impact range and the reentry device was released and inflated some 356 seconds after the launch and the altitude of 238 kilometers. The spacecraft entered the discernible atmosphere at the altitude of 100 kilometers and soon after its transmission was interrupted by the layer of plasma, as expected during the reentry. With the dissipation of plasma, the radio contact was restored and continued for 25 seconds. No further data came from the craft and no debris was found at the expected landing site. Some preliminary information indicated that the spacecraft might have overflown Kamchatka and fell into the Pacific Ocean. 2006 May 26: A small Russian satellite orbited Earth following an unusual launch from the depths of the sea. After a two-day delay due to technical problems, the Shtil converted ballistic missile blasted off from a submerged K-84 Yekaterinburg submarine in the Barents Sea on May 26, 2006, at 22:50 Moscow Summer Time. The rocket carried an 86-kilogram Kompass-2 science satellite designed to study physical phenomena associated with earthquakes. According to official Russian sources, the vehicle reached a 400 by 620-kilometer orbit with the inclination 78.9 degrees toward the Equator at 23:06 and the payload separated at 23:06:48 Moscow Time. 2006 June 30: A submerged Northern Fleet submarine of the 667BDRM Project stationed in Barents Sea launched the R-29RM Sineva missile. 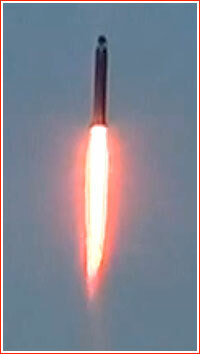 The missile blasted off at 10:25 MSK (06:25 UTC) and flew toward the Kura test site in Kamchatka. According to the Russian Navy, the warhead successfully reached its target. 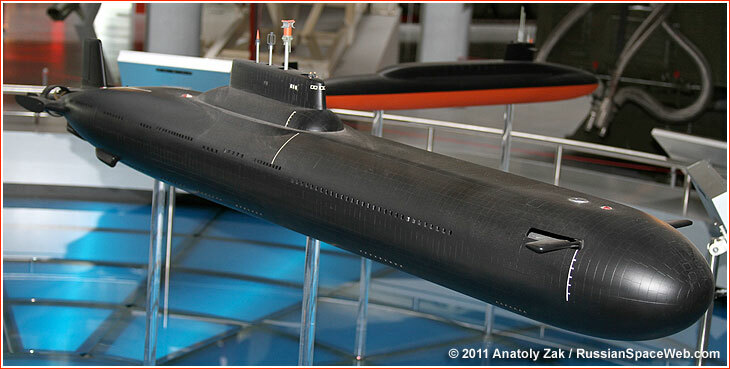 The Russian press reported that the submarine that launched the missile was K-114 Tula. If confirmed, this would be the first launch from that vessel after its return from overhaul in January 2006. 2006 Sept. 9: The Yekaterinburg submarine fired R-29RM Sineva missile from the north pole region toward the impact range in the Arkhangelsk Region. 2007 Dec. 25: The Tula submarine of the Northern fleet launched a Sineva missile (R-29RM), Roskosmos announced. The agency said that the testing of the missile complex was completed in 2004 and its was accepted into the armaments in July 2007. 2008 Oct. 12: The Zelenograd submarine in submerged position launched a ballistic missile from the Sea of Okhotsk to the Chizha impact range on the Cape of Kanin Nos in northern Russia. 2008 Oct. 12: The Yekaterinburg submarine in a submerged position launched a ballistic missile for the Barents Sea to the Kura impact range on the Kamchatka Peninsula. Launches were conducted within Stabilnost (Stability) 2008 strategic and command war games. 2010 Aug. 6: Russian Northern fleet conducted a launch of a ballistic missile from a strategic nuclear submarine, official Russian media reported. According to the Interfax news agency, the Tula submarine (project 667BDRM Delfin) launched a Sineva missile (also known as R-29RMU2) on the evening of August 6, 2010. The missile's warheads reportedly reached the Kura impact range in the Kamchatka Peninsula. 2010 Oct. 28: Russian navy launched a pair of R-29-type ballistic missiles. The K-117 Bryansk submarine stationed in the Barents Sea launched an R-29RMU2 Sineva missile at 14:30 Moscow Summer Time toward the Kura impact range on the Kamchatka Peninsula. On the same day, the K-433 Svaytoi Georgy Pobedonosets submarine launched an R-29R missile from a submerged position in the Sea of Okhotsk toward the Chizha impact range on the Kanin Nos Peninsula. 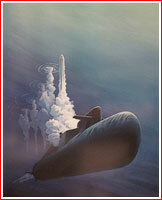 2011 April 26: Russia's Northern fleet launched a ballistic based missile from a nuclear submarine. According to the official Russian media, the Yekaterinburg submarine led by the Rank I captain, Igor Stepanenko, fired a Sineva missile (also known as R-29RMU2) from a submerged position in the Barents Sea within the Arbalet (Crossbow) project. According to the Russian Ministry of Defense, missile's multiple warheads reached their targets at the Kura impact range in the Kamchatka Peninsula. 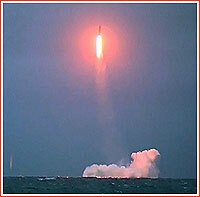 2011 May 20: Russia's Northern fleet launched a ballistic missile from a nuclear submarine. According to the official Russian media, the Yekaterinburg submarine fired a Sineva missile (also known as R-29RMU2) from a submerged position in the Barents Sea. An official representative of the Russian Ministry of Defense, Igor Konashenkov, was quoted by the Interfax news agency as saying that missile's multiple warheads reached its targets at the Kura impact range in the Kamchatka Peninsula. 2011 July 27: According to the official Russian media, the Yekaterinburg submarine fired a Sineva missile (also known as R-29RMU2) from a submerged position in the Barents Sea. The Russian Ministry of Defense said that missile's multiple warheads had reached their targets at the Kura impact range in the Kamchatka Peninsula. 2011 Sept. 29: A modified version of the R-29RMU2.1 missile, officially identified as Lainer was launched from the Tula nuclear submarine of stationed in the Barents Sea. The rocket flew a test mission in the direction of the Kura impact range on the Kamchatka Peninsula. According to the Russian Ministry of Defense, the Lainer missile had a modified systems for more effective penetration of anti-missile defenses. Following the launch, the missile's warheads successfully reached their targets, the Ministry of Defense said. 2014 May 8: During a major "command and control exercise" of the Russian armed forces, featuring multiple missile launches, a Tula submarine stationed in the Barents Sea fired an R-29RM missile toward the Kura impact site. A similar submarine of the Pacific Fleet -- Podolsk -- which was deployed in the Sea of Okhotsk off the Russian east coast launched an R-29 missile aimed at the Chiza impact site on the Kanin Nos Peninsula. The latest launch marked the reintroduction of the Podolsk submarine as a launch platform after a more than decade-long hiatus. 2014 Nov. 5: The Tula submarine submereged in the Barents Sea launched an R-29RMU Sineva missile, which delivered its warheads toward the Kura impact site on the Kamchatka Peninsula, Russian Navy officials said. 2015 Oct. 30: The Bryansk submarine of the Northern Fleet stationed in the Barents Sea and the Podolsk submarine of the Pacific Fleet deployed in the Sea of Okhotsk fired ballistic missiles (probably R-29RM-type). 2015 Dec. 12: The Verkhoturie submarine (Project 667BDRM Delfin) stationed in submerged position in the Barents Sea fired the Sineva (R-29RMU2) missile toward the Kura impact range on the Kamchatka Peninsula, the Russian Ministry of Defense announced. 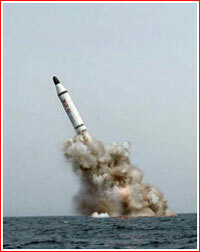 The missile worked as planned and its warheads reached their targets, the announcement said. It was the 27th firing of the missile for this type of submarine, which was upgraded in 2012. A sub-surface launched SLBM with a 1,000-km range for Project 639 submarine. Not implemented. A sub-surface launched SLBM with a 600-km range for Project 629 submarine. Not implemented. A sub-surface launched SLBM for a Project 639 submarine and the D-4 complex, assigned to OKB-586 on Dec. 3, 1958. Calmar (16 missiles). In armaments since 1979.